bedroom has King size bed. The unit is on the 1st floor above a covered garage. Gated community with a dock on the river. Also has a marina and private beach. Observation deck on the river. Private launch ramp. 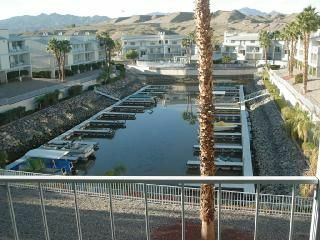 Condo is across the river from the casinos and minutes away from Lake Mohave. We enjoyed our stay. Great location, comfortable clean condo with all the amenities. We plan to return. Condo was perfect for us, just as described when we booked it. Great location, quiet and comfortable. Owner quickly responded to us on our questions. We’re ready to book again for next year!! Thank you so much for the kind word. It was a pleasure having you stay with us. Overall enjoyable. Some outdated appliances and minor repairs needed. Had to wash linens before using beds. Other than that would book a future stay. Weekly Rate: $600 - $600 Monthly Rate: $1150 - $1350 $500 wk, $1350 mo.,$1150 MO. OCT-NOV $500 security fee. Utilities paid to $100 mo.$100 non-refundable cleaning fee.$500 due at booking, fully refundable to within 60 days of arrival. The booking fee will also serve as a security deposit and will be refunded within 30 days after the condo is vacated if there is no damages. Also any overages of the utility allowance will be deducted from the deposit.